In the December 2008 story, “Coal or Candy Cane?,” you gave a candy cane to Dan Gilbert of Quicken Loans for his plans to build a new headquarters downtown. I suggest you with- hold the candy until Dan helps former Rock Financial customers. Once their homes are saved, then Dan may have his candy! You had the audacity to give Gov. 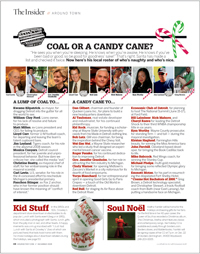 Jennifer Granholm a candy cane for “her role in attracting the film industry to Michigan” [December 2008, “Coal or Candy Cane?”]. You should have given her a lump of coal for driving out most other industries, including her overseeing the death of the auto industry. She is beholden to the unions who voted for her, and has offered no viable solutions to help out the Big Three. She may be creating a few hundred transient jobs with the film industry coming into Michigan, but how many thousands have lost their jobs and how many other thousands have left the state during her administration? I enjoyed My First Car [January 2009]. Cars have always been a big part of my life, having worked in a Trim Plant owned by the Fisher Brothers, who sold OEM trim parts to Fisher Body. This dates back to 1954 when the plant was in Norwalk, Ohio. Working in material procurement, quality control, and fabricating procedures, my main contact in Detroit was W.A. Fisher. Now my direction has turned to antique cars. I started with a 1932 Ford “A” Victoria Sedan and have since owned a 1929 Ford “A” Phaeton and a 1930 Ford Murray Town Sedan. I also have a restored 1937 Plymouth convertible. If you want to look at an appealing era with true classic design, look at the cars of the 1930s. My first? A 1939 Dodge four-door Luxury Liner. As an avid reader of Hour Detroit and lifelong resident of Michigan, it disappoints me that our own DIA director is choosing to buy a Volvo instead of buying an American-branded car. I know, I know. Ford owns Volvo. But how many Swedes will be visiting and donating to the DIA? — Ronald Bratke, Wixom[“My First Car,” January 2009] was a fun read. [However,] I find it interesting that, in these perilous times, people hand their money over to a foreign automaker. With the ability to purchase virtually any vehicle, [why] choose against our automotive industry? I, like numerous others, vote with my feet and my dwindling discretionary income for — or against — those (and the institutions they represent) based upon their choices. Just wanted to add another company to your “Taste of Michigan” list [January 2009]: Global Warming Salsa Co., globalwarmingsalsa.com. We have won 11 national awards since we started in 2007, including the 2007 and 2008 Hot Pepper Award (best overall) and a 2009 Scovie Award for our Global Warming: End of the World Salsa. We are bottled in Auburn Hills, have our labels made in Wixom, and we even recycle our empty jars at the Davisburg Candle Factory. A portion of our proceeds goes to developing exercise and nutrition programs for Michigan children. I just finished “On the Losing End” [January 2009] and enjoyed it very much. I remember the glass Coca-Cola bottle when it was 6-1/2 ounces. As young children, my sister and I were allowed to share one bottle on Friday and Saturday evenings. That would make our portion 3-1/4 ounces. You are absolutely right that we have all been gradually super-sized. Thanks for reminding me about portion size. I will keep it in mind as I begin my annual New Year’s resolution to lose weight. I’ll just eat like it’s 1953. I loved your piece headlined “Banishing Act” [December 2008]. I have one more to add: I wish people would stop saying “I seen something.” The word “seen” needs a helping verb, such as have or had. [Regarding “Banished Words,”] I absolutely cringe when someone says “nother.” I’m glad you included it. Now, if only we could get people around here to drop the [incorrect] “s” from Nordstroms, Meijers, etc. Your article “Banishing Act: Words That Need to Go” highlighted a few valid points. But saying that “we’re so blessed” sounds “smug” — really? Tell that to the thousands of people who are just hanging on in this economy but taking time to stay positive about the good things in life by verbalizing the “offending” phrase. “Smug” describes an article like this one that proclaims what’s “in/good” and “out/bad” as if it were truth and not opinion. Editor’s note: In our opinion, the clichéd and self-congratulatory overuse of “we’re so blessed” can have the effect of offending those who are feeling less than blessed at the moment. What a surprise to discover your vivid story [“Rumor Had It,” November 2008]. I enjoyed it. I don’t have the faintest idea if I inserted an embellishing word like inamorata, but who cares — I can barely spell it anymore … and I don’t remember any legal entanglement as you described … but I did indeed edit Carol’s columns just as I did, or attempted to, for Matt and Susan, both of whom I hired, both of whom had a very high skill level. After [editor Bill] Giles left, sometimes I felt I was the only one in the building who believed in “Yours Truly” as an important part of the paper. I was pleased by your story to see that others felt the same excitement. I miss those days; how I wish I could do it all over again. 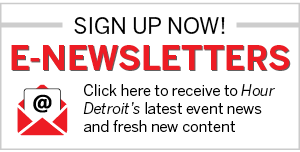 — Gerry Storch, Naples, Fla.
Editor’s note: Storch is a former editor at The Detroit News.